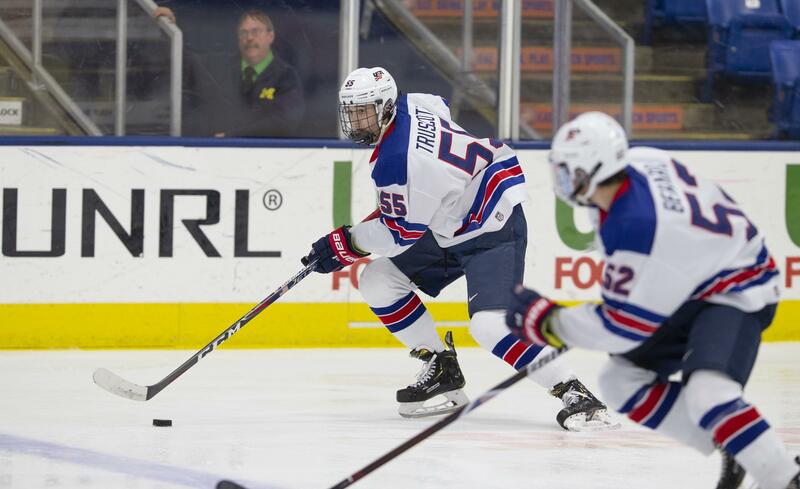 YOUNGSTOWN, Ohio – Ryder Rolston (Birmingham, Mich.), Luke Tuch (Baldwinsville, N.Y.) and Dylan Peterson (Roseville, Calif.) all scored, but the U.S. National Under-17 Team ultimately fell to the Youngstown Phantoms 4-3 Sunday evening (March 31) at the Covelli Centre. The Phantoms took an early lead on the power play 6:54 into play. Team USA responded less than two minutes later with a power-play goal of its own when Ryder Rolston (Birmingham, Mich.) buried a shot from the top of the left circle after intercepting a pass from Thomas Bordeleau (Houston, Texas). Luke Tuch (Baldwinsville, N.Y.) gave Team USA the lead when he backhanded a rebound off an initial Ty Smilanic (Elizabeth, Colo.) shot with 7:17 remaining in the first, bringing the score to 2-1 entering the first intermission. The second period began with a goal scored by Dylan Peterson (Roseville, Calif.) just 1:43 into the frame. The play began when he skated the puck out of the neutral zone with Danny Weight (Lattingtown, N.Y.) on a two-on-one, passed the puck to Weight who quickly set him up at the left post. With 7:02 left in the middle stanza, the Phantoms closed the gap to 3-2 with a breakaway goal. Team USA and Youngstown both exchanged scoring chances on the power play throughout the first half of the third frame, until Youngstown tied it with 6:49 on the clock. Noah Grannan (Germantown, Wis.) competed hard in the final minutes, stopping multiple Youngstown shots on net, but was beat with 1.5 seconds left in regulation to account for the 4-3 final. Drew Commesso (Norwell, Mass.) started in net for Team USA and stopped 15 of 16 shots faced in 31:19. Grannan saved 12 of 15 shots faced in the remaining 28:41. The U.S. National Under-17 Team will be back in action on Friday, April 5 against the Fargo Force at Scheels Arena in Fargo, N.D.
NOTES: Team USA was outshot by the Phantoms 31-24, went 1-for-6 on the power play and 4-for-5 on the penalty kill.